On my last pick up of cedar, I grabbed these big boards. I thought that they were cedar, they look exactly the same in this state. However, on the first cut I could smell that they were Pine. 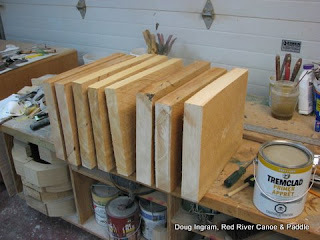 Pine is not what I use for canoe building, so I put them aside until I could figure out what to do with them. 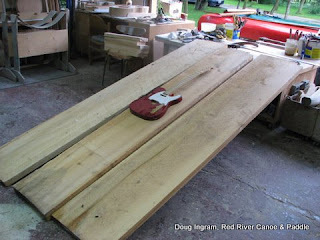 Frequenting a Telecaster guitar forum, I came to realize that many builders highly value Pine for bodies. Aha! So that is what I did with them. They are cut down to body size or drying until I need to process them further. Here you can see my Tele sitting on top for scale. They take up a lot less space this size, too! Storage i one of the reasons that I cut them down now. Posted by Doug Ingram at 11:10 a.m.